Greetings of good tidings! We are glad to inform you that the effort here in Brgy. 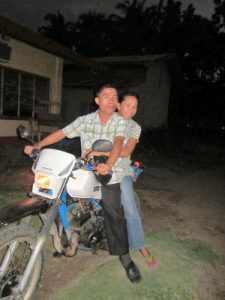 Antonino Labason, Zamboanga del Norte was successful with the help of God and through the support of the brethren. The crusade lasted for 3 weeks. Pastor Onofre Flores and Pastor Nildo Mamac shared the gospel and health truths to the people. We praise God for at the end of the effort, 171 precious souls accepted Jesus as their personal saviour. Eighteen of them were my Bible students. Thanks to the sponsors of Adopt a Minister for your prayers and financial support. Rest assured that by God‘s grace, we still continue to help hasten His return. 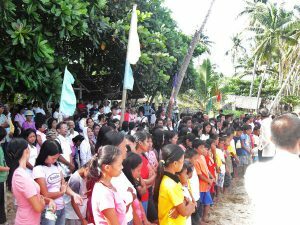 Labason SDA Church is under the banner of Zamboanga Peninsula Mission, which is located in one of the most secluded territories of the peninsula where “moros” or Muslim people live. It is the main highway for the entire insurgent group and besides this, Labason has a lot of “Out of school youth” that sometimes ignite trouble and riots in the town. One day, while Joy (my wife) and I went for our visitation rounds, we visited a brethren’s house. There we met a young person who was very ill and on the verge of death. This young man shared with us his hopeless life. As he spoke, gloom and sadness showed on his face. He told us that he was the “Mad Beast” in the community of Labason because of his heartlessness. He was the leader of the most terrible group of bandits in the town with members numbered no less than a thousand. This group’s members have different skills to do evil operations. But the group’s leader became very ill so, he had to stay home. After sharing his story with us, we offered a special prayer for him for God to intervene in his life. A week later, we visited him again and he told us that he was rushed to the hospital the day before our visit but when he arrived at the hospital, the doctor recommended that they take him to a specialist. However, since his family did not have the funds, they brought him back home after buying the medicine prescribed. After our conversation, we offered another prayer for him together with his family and asked him if it is all right if we give him water therapy. He agreed. We prayed again and begged God for help. Then we gave him hot foot bath and a Swedish massage. We did this twice a week and soon we became friends. 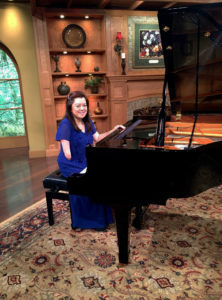 As days and weeks passed by, he started to regain his strength through God’s grace. One month after the treatment, the ground breaking started for our evangelistic effort. We invited our new friend to join us in our work in that it might help his full recovery. At first he hesitated but later he joined us in our prayer meeting and there he told us everything bad that he had done to the community. After sharing his dreadful life, he decided to totally change and serve God. 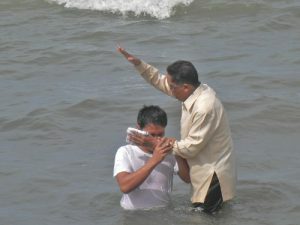 So, he requested for rebaptism (he was baptized at the age of 12 but stopped going to church and became a rebel to the community for more than 17 years). Jezreel Gadiane is now 29 years old and has renewed his commitment to God and had become an active, humble member of the church. Today, he is the partner of our church’s lay worker while he calls on his gang members to change course in life as he did. From a furious beast, Jezreel became a white, foment (encourager) dove to his comrades. Let’s pray for him! God bless us more as we continue to seek and save the lost ones. Thanks so much to the sponsors for your prayers and financial support for us – God’s workers here in the Philippines.